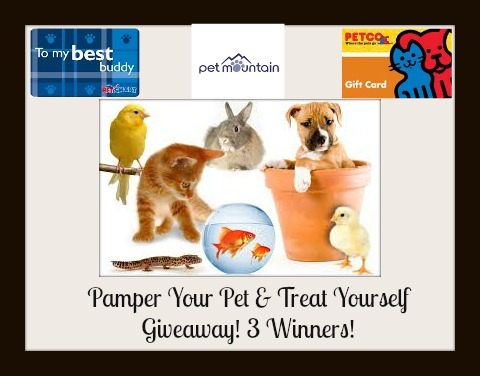 Pamper Your Pets and Treat Yourself Giveaway | A Savings WOW! Tableclothsfactory.com has all of your party needs and some you might not even think about getting. So many great decorating ideas and more! Planning a wedding? Baby shower? Formal event? They have just about everything you will need for decorating! We will have THREE winners that will take home a generous gift card and some very fun Tableclothsfactory.com items! Check them out! Welcome to Pamper Your Pet & Treat Yourself Giveaway! Hosted by: SuperFrugalStephanie.com and sponsored by: Tableclothsfactory.com! Disclaimer: The participating bloggers were not compensated for this post. We are not associated with any of the companies named above. No purchase is necessary to enter. Void where prohibited by law. The odds of winning are based on the number of entries received. The sponsor(s) will be responsible for product shipment to winner(s) of this giveaway. My blog is not responsible for product shipment/delivery. This event is in no way administered, sponsored, or endorsed by, or associated with, Facebook and/or Twitter, Google, Pinterest, Instagram or Klout. This disclosure is done in accordance with the Federal Trade Commission 10 CFR, Part 255 Guides Concerning the Use of Endorsements. It is at the sole discretion of the admin of the giveaway if the winner has met the rules or not. I love the Grandiose Rosette Table Runners – Navy design.